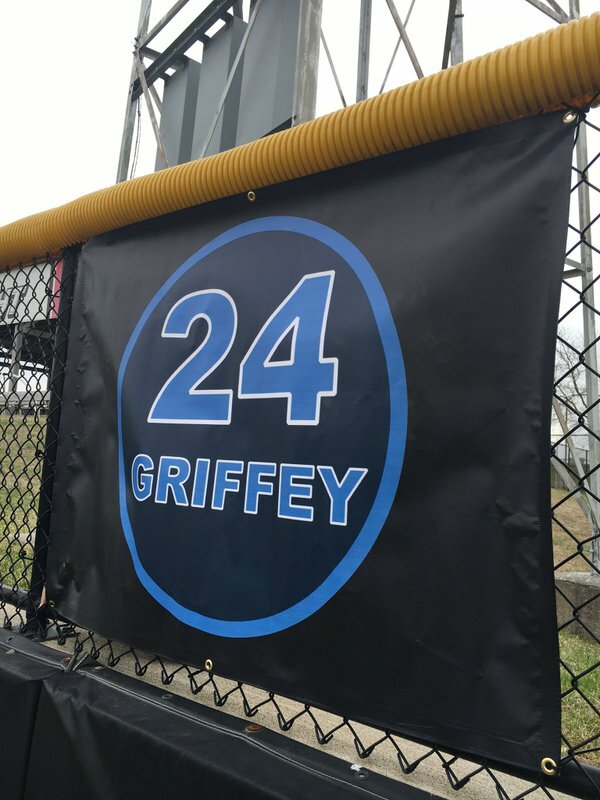 The Clinton LumberKings hung a sign paying homage to Ken Griffey Jr. on the outfield fence at Ashford University Field this weekend. The LumberKings are the Midwest League affiliate of the Seattle Mariners, for whom Griffey played 13 of his 22 major-league seasons. Griffey was elected to the National Baseball Hall of Fame earlier this year, receiving the highest vote percentage (99.3) in Hall of Fame history. He will be the first player to wear a Mariners cap on his Hall of Fame plaque, as former Seattle teammate Randy Johnson has an Arizona Diamondbacks cap on his plaque. This entry was posted in Baseball Hall of Fame, Clinton LumberKings, Midwest League. Bookmark the permalink.